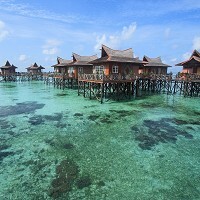 Resorts such as this one on Mabul Island are why tourists are drawn to Malaysia. A British tourist faces surgery after flying home from Malaysia with a six-centimetre flatworm embedded in her arm. Twenty-eight year-old Emma Buckley was on holiday with her boyfriend and her brother at a resort in the Perhentian Islands. She will now be treated at the Liverpool School of Tropical Medicine where doctors say it is the first time that they have seen the parasite lodge in a patient's arm. Ms Buckley remains surprisingly calm about the situation. She said: "Everybody is shocked when they see it, but I feel really laid back about it all. I've heard horror stories of people dying from parasites; I know I'm in the best possible hands." Typically the flatworm is located in a patient's digestive system. Doctors believe the parasite was probably caused by contact with undercooked meat or fish, although they had initially suspected it might have been contracted when Ms Buckley rescued a pigtail macaque monkey. This cautionary tale certainly demonstrates why so many holidaymakers now choose to invest in medical travel insurance when flying overseas.